In an Internet Week panel entitled Search & Social: A Love Story, Mashable Business Editor Todd Wasserman sat down with About.com Director of Research Laura Salant and Buddy Media VP of Analytics and Insights Tami Dalley to discuss the interplay between and the roles search and social currently play. In terms of the usage of search, Salant said 50 percent of searches are what she terms "answer me" which she defined as quick searches such as finding a particular site or looking of a movie review. She termed 25 percent of searches "inspire me" which she described as searches that fill a passion or a hobby. Lastly, she noted 25 percent of searches are "educate me" which, for example, could be the answer to an ongoing health issue or long term planning for a wedding. Don't miss it. Wait, miss what? The Webby Awards! Critically-acclaimed stand-up comedian, writer, and actor Patton Oswalt will host The 16th Annual Webby Awards on May 21st at The Hammerstein Ballroom. The show, which honors excellence on the Internet and is known for its iconic (mostly) 5-word acceptance speech policy, will present awards to this year's Webby Award and People's Voice Award winners. In Demand Media's packed Internet Week session entitled "Creating and Sharing Content for Real Life: Content as a brand differentiator," three representatives of the agency discussed the concept and implications of "pull marketing" in the current landscape. In a nutshell, this idea is the same as it always was: it's better to find out what consumers want and provide it than to create content and "push" it out, hoping to create demand where there was none before. The internet now provides brands with more insight than ever before regarding what customers actually want - so it's on brands to make useful, meaningful content. In a presentation given at OMMA Social during Internet Week, comScore Media Evangelist Eli Goodman rattled off a plethora of juicy social media facts and figures. Here are but a few for you to digest. - 1.2 billion people access social networks on their computers. - One of every five minutes spent online is on a sial network. - 1/3 of social network users are located in Asia Pacific. - Five of the most engaged markets for social networking are in Latin America. Day two of Internet Week kicked off with a panel conversation led by Internet Week Founder David-Michel Davies who interviewed New York Times writers David Carr and Brian Stelter. The three discussed the changes in publishing that have occurred over the past decade. The conversation was an interesting, yet friendly, dichotomy of old versus new. Carr has been a journalist for many year. Stelter has been for five years of so. Carr is old school. Stelter is new school. But each have learned from one another and the two say they are each better for it. No, Seriously! This Really is the Year of Mobile! During Internet Week, OMMA held its OMMA Mobile one day conference. In a panel entitled How Not to Waste Money on Mobile, moderator Shaun Quigly, VP Digital Practice Leader at Grunner was joined by Alexandre Mars, CEO of Phone Vally, Allison Owen, Digital Media Specialist at The Integer Group and Craig Weinberg, Mindshare Mobile Practice Lead. For all the hoopla we've heard about mobile over the last ten years, we are still talking about how "this is the year of mobile!" Well after listening to this panel, it is clear, mobile has a long way to go before it becomes an "established" medium. Big Data, the new, all-encompassing term for the plethora of data that needs to be wrangled to effectively manage an online campaign took center stage at Internet Week this morning. Billy Beane, manager of the Oakland A's and made famous in the Brad Pitt movie, Moneyball, spoke to a full house about his discovery of the importance of data in managing a baseball team. Before the use of statistics as a guiding force in the management of a baseball team, many decisions were based on emotion and other less-that-scientific modes of decisions. Much like the early days of advertising when everything was based on a gut feel and a big idea, baseball management didn't believe in the power of data. That has changed in the past 12 years and is now an institutionalized form of management in baseball. Beane's advise to the advertising industry is that mathematics will always work if you trust it. Now, we can hear a great many of you groaning right now and asking, "How the hell does data help me develop cool creative?" It doesn't directly but it sure does indirectly and has been doing so for decades. 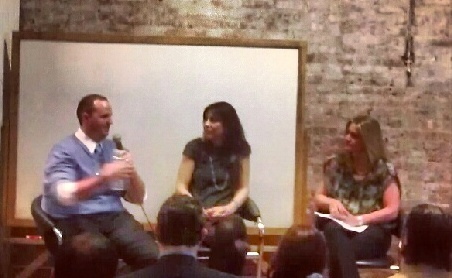 Internet Week kicked off in New York this morning with a lot of chest beating about the city's tech start up scene. But the chest beating is warranted given that the city is now neck and neck with both Boston and Silicon Valley when it comes to the number of start ups launching and the amount of investment capital (nearly $500 million in 2011) behind those launches. Both Internet Week Founder David-Michel Davies and New York's Chief Digital Officer Rachel Sterne lauded the cities growth in the tech space and noted that over 45,000 people will attend over 200 events this week during Internet Week. That's in contrast to less than 10,000 people and 80 events when it launched five years ago. From panels and parties to concerts and conferences, over 200 events will take place next week in New York City during Internet Week New York from May 14-21. More than 45,000 people are expected to attend the festival which will tout the city's desired leadership position in digital culture, commerce, finance, fashion, media, advertising, and entertainment. Internet Week New York, which is presented by Yahoo!, will feature varied events hosted by a a number of organizations from startups like Tumblr, BuzzFeed, and Warby Parker to veteran companies like Time Inc., IAC, and AOL. The events will be headlined by a range of thought leaders, including Bjork, Louis C.K., Billy Beane, Barry Diller, Annie Liebowitz, Anthony Bourdain, David Carr and Brian Stelter of The New York Times, and Mozilla Foundation chair Mitchell Baker.